Euro, World Cup and national championships! 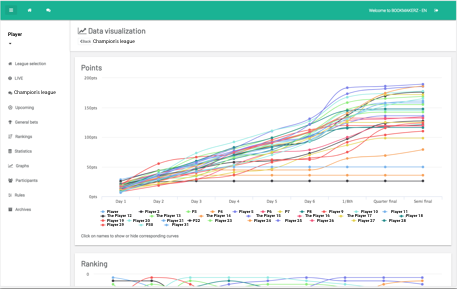 Select the competition you want to follow, define parameters for odds and points, then launch it! Register their email address, they will receive an activation email if they don't already have an account. Feel the pressure on even the most insignificant games and comment live the ranking evolutions. All fixtures are already loaded on the site. Place your bets without money involved and not even the administrator has to calculate a point or ranking! FIFA World Cup 2018 matches are already loaded on the site and ready to bet. Didn't believe a Peru - Denmark could be interesting? Wait until it gives you an opportunity to take the lead of the rankings with a perfect score! The key with Bookmakerz is that you are not rewarded based upon fixed points or whatever experts believed would be a probable outcome. You and the other participants are the actual bookmakers, you decide what are the odds! Every body tried to score points by betting against the favorite and you didn't? That can be great for you! Review when luck was on your side and the key moments that led you to the top... or the bottom of the rankings. 2018 edition adds up the long awaited graphical evolution feature for rankings and data amateurs. Check and uncheck curves to review performances in particular, stay in awe in front of your "remontada" even though you ended up far from the podium! 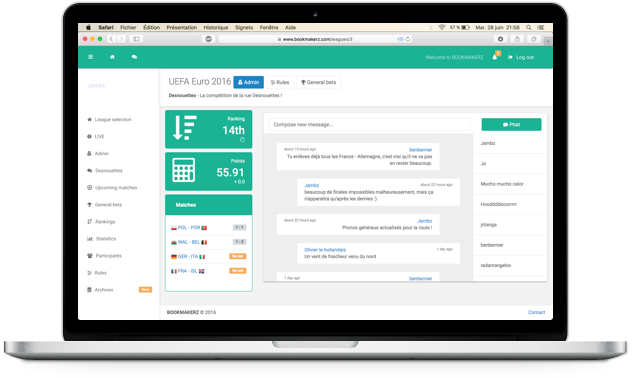 "To organize private and customizable competitions with colleagues at work, there's nothing better than Bookmakerz!" "Even French people can be excited to follow an Iceland - Austria when betting on Bookmakerz"
"Site very intuitive, the only difficulty is to follow the actual games!" Do not hesitate to share comments and suggestions.